Your Boxster S might not be able to go 0-60 mph in less than three seconds, but it does share the same lifeblood and heritage of other Porsches that can. Known for more than just good looks, Porsche has successfully established a long-standing history of producing some of the fastest and top-performing production sports cars in the world. With extensive Nurburgring track records to prove the speed and handling of many of their models, it’s no wonder that the Porsche brand name is often associated with neck-breaking high-performance. Really, who would want to race around a track in anything less than the excellence of a Porsche? Admittedly, our team of independent Porsche mechanic experts at HOUSE Automotive are a little bit biased when it comes to our favorite automotive manufacturer. But who could blame us? 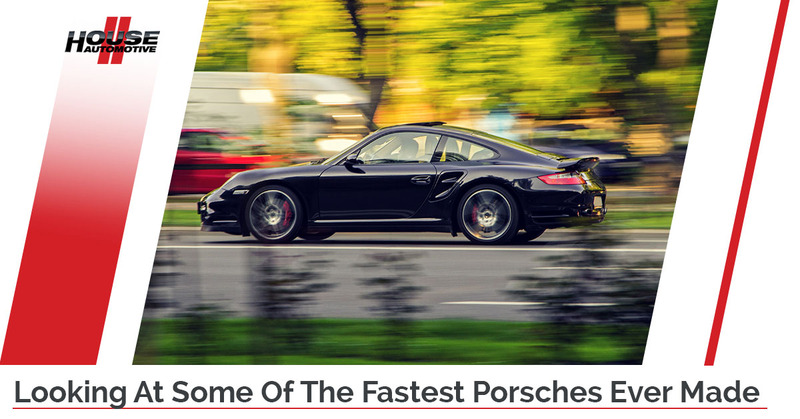 Porsches are fast, great-looking, and incredibly engaging to drive. After all, we are Pasadena’s preferred independent Porsche service provider, so it’s fair to say that our love for the Porsche brand goes pretty deep. As an expression of our Porsche appreciation, our independent Porsche specialists are going to go ahead and take a quick look at some of the fastest production model Porsches ever made. We might not get to work on the very fastest Porsches every day, but again, every single model that we work on does share the same racing heritage as the highest performance models. Keep reading below to learn something (or a few things!) new, or check out our independent Porsche repair services. This iconic supercar shares the ranks with other exotics like Lamborghinis and Ferraris. Originally produced between 2004 and 2007, this 201.5 mph speedster is capable of reaching 60 mph in just 3.5 seconds. With an impressive 199 horsepower per pound ratio, the Carrera GT saw a rise to fame in European and American automotive markets, racing video games, and other outlets. Fast forward several years later and what you’ll see here is a re-engineered yet stylishly similar version of previous 911 models. This road-legal sports car boasts a top speed of 196 miles per hour, capable of reaching 60 mph in just 3.1 seconds. By way of comparison, the 911 Turbo S is roughly as fast as the classic McLaren F1, trailing only just behind at speeds of over 100 mph. The 911 never fails to strike us as the standard of German automotive engineering excellence. At a relatively stiff price of over $135,000, however, you’ll definitely have to pay to play with this one. The Panamera might not be the fastest production model, nor is it the best looking (this, of course, is entirely subjective – we still like the Panamera! ), but it’s hard to find a four-door sedan that’s this fast. With a top track speed of 188 mph and the ability to go from 0-60 mph in just four seconds, the Panamera Turbo definitely has its well-deserved spot among other fast production vehicles. Really, you just can’t fit in the whole family and the dog in a two-door Carrera, so the Panamera stands out in a class of its own. Now, the Panamera might not be able to handle off-road terrain quite like the Cayenne, but 0-60 mph in four seconds for a four-door vehicle is impressive to say the least! This vehicle really blurs the line between production car and track-only car, especially when you put the pedal to the floor. Featuring a blistering top speed of 205 mph and a 0-60 mph time of some 3.4 seconds, this exclusive model of the iconic 911 was capped at just 500 units. At a price of nearly a quarter million dollars, the exclusivity of this particular Porsche model makes sense – we definitely would not recommend street parking this incredible machine. With over 700 horsepower available at the flex of your right foot, the 911 GT2 RS really would be one of the ultimate driving experiences. Move over, BMW! To us, every car we work on is as important and cool as the 911 GT2 RS we just mentioned. At HOUSE Automotive, we strive to provide an unparalleled level of independent Porsche service in Pasadena and Beverly Hills. The next time you’re searching “Porsche mechanic near me” on your computer, take your car to the team who cares. Contact HOUSE Automotive today!